Having had a full fit squad from which to select, Riversiders’ boss Lee Baker was forced into a change inside the first 30 seconds. Tom Graham, who has probably been their most consistent performer this season, suffered what appeared to be a pretty serious injury. He turned, only for his standing leg to give way and after lengthy treatment, he was clearly unable to continue with Alex Hay replacing him at right-back. This setback did not impact Garstang, who looked sharp in the early exchanges with Jonny Hothersall and Danny Birch causing problems down the left. The first chance came as Garstang counter-attacked quickly and Alan Coar’s good play set up Hothersall whose shot was well saved. Wrens’ speedy forwards were always going to keep the Garstang defence honest as they looked to get behind the defence at every opportunity. At the other end, Alan Coar had a half-chance after a good pass from Gaz Fawcett as Garstang were a match for Wrens in the early exchanges. The game changed when Wrens were awarded a very soft free-kick 30 yards out from Garstang’s goal. Danny Morris curled the ball around the Garstang wall and past Dan Curwen’s outstretched hand, going in off the post to give Wrens an undeserved lead. Though Wrens were applying more pressure after the goal, Dave Jack saw a free-kick fly over their bar and an effort from 25 yards go just the wrong side of the post. 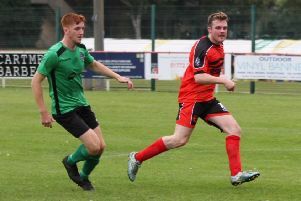 Alan Coar was cynically fouled when going for a return pass, resulting in a yellow card for the Blackpool centre-half, while Jack Swindlehurst went close with a header as Garstang trailed at half-time. There was controversy straight after the restart when Swindlehurst was fouled and, immediately after the whistle was blown for a free-kick, he was kicked whileon the ground. Inexplicably to the large crowd, the referee chose only to show a yellow card. This, however, seemed to spur Garstang on and Alan Coar latched onto a long ball and his goalbound shot was turned onto the post by the keeper. Rick Coar headed over from the resulting corner before beating three players and seeing a shot saved at the near post. Another controversial decision came when Fawcett, having beaten two players, was fouled as he was about to shoot but the penalty claims were waved away. Andrew Murphy and Alex Colquhoun were introduced as Garstang started to push for the equaliser. Both were denied by the woodwork, Murphy’s cross having been misjudged by the Wrens’ keeper and Colquhoun hitting the post from long range. In the latter stages the game became very stretched as Garstang started to take chances. On a rare breakaway, as the clock was ticking down, Wrens extended their lead when a long ball reached Morris, who calmly the advancing Curwen to kill off the game.